The global hair transplant services market is witnessing a rise in its demand. The market is segmented into three major transplant procedures like scalp reduction, follicular unit strip surgery and follicular unit extraction. In Follicular Unit Strip Surgery a large strip of hair follicles of donor tissue can be extracted from the back of the head/scalp (specifically, the occipital area) and trimmed into individual follicular unit grafts and re-implanted in the required bald area. Follicular Unit Extraction method is developed after FUSS method in which grafts are manually collected from the donor area by using punches and re-implanted in the recipient area. In this method each follicular unit graft can be directly removed from the back of the scalp without a strip of tissue being removed. FUE method is a painless method and does not consist any stiches or cuts, permanent visible scarring or unnecessary discomfort. Scalp reduction method is only used in severe alopecia cases or traumatic burn conditions. 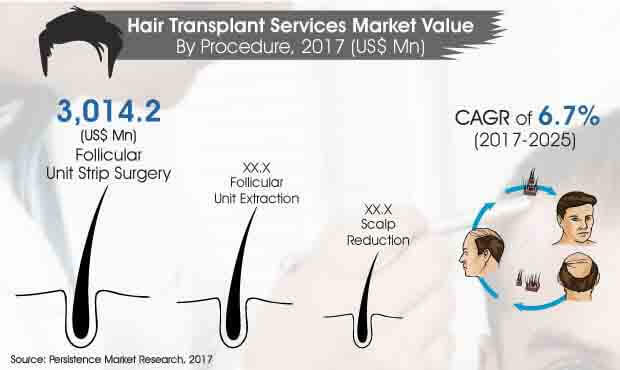 Among these procedures, Follicular Unit Strip Surgery (FUSS) leads the market with an expected market size of over US$ 5,200 Mn by the end of 2025, growing at a CAGR of 7.1% during the forecast period. Follicular Unit Extraction (FUE) is also expected to be an attractive segment witnessing a growth rate of 6.2% during the forecast period. The technology for FUE has evolved significantly since it was first introduced and the quality of the service has substantially improved. Rising consumer emphasis on physical appearance has led hair care centers to widen the sales of hair transplant. Advertising strategies for hair care by hair care centers vary according to their targeted audience. For example, a highly differentiated hair salons can do well to place an advertisement in mediums such as newspapers and magazine, and on television. Manufacturers are increasingly focusing on third-party certification in order to gain customers’ trust towards brands. Looking at the demand for hair loss treatment products, many pharmaceuticals and cosmetics manufacturers are improving their product line and adding anti hair fall products. Manufacturers of hair loss treatment solutions are increasingly focusing on providing hair loss solutions (with both functional and active ingredients) with multifunctional effects. Also, such innovations by leading hair care manufacturers have become a necessity in the market. The increase in hair transplant procedures taking place, has also increased the concerns of people regarding its side effects. Several medicines were reported having side-effects on people. In March 2015, consumer-rights law firm Hagens Berman filed a lawsuit, alleging hair loss drug Propecia, which contain the active ingredient Finasteride, manufactured by Merck and Co Inc., induces serious side effects, resulting in depression, followed by suicide ideation. In addition, the medicine has reportedly caused serious effects, including permanent sexual dysfunction. As of December 31, 2013, approximately 1,140 lawsuits have been filed against Merck, alleging persistent sexual side effects following cessation of treatment with Propecia. In addition, approximately 20 of the plaintiffs allege that Propecia has caused prostate cancer or male breast cancer. Such reports may result in a negative impact on the global hair transplant services market growth.